Born at Dayton, Ohio, December 30, 1931, he attended Ohio State University from 1950-52 and graduated from Texas Tech at Lubbock with high honors in electrical engineering, getting his B.S. degree in 1960. 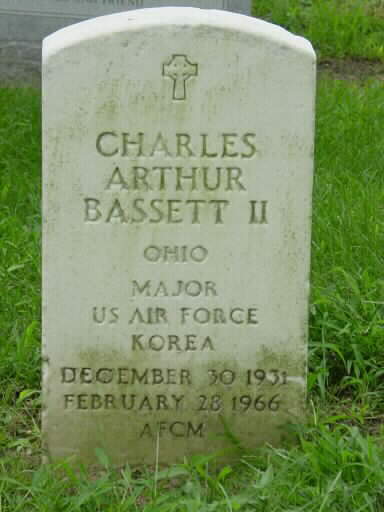 He did graduate work at the University of Southern California and entered the United States Air Force in October 1952 as an Aviation Cadet. He trained at Stallings Air Force Base, North Carolina, Bryan Air Force Base, Texas, and Nellis Air Force Base, Nevada, completing advanced work in April 1954. He went to the Pacific with the 8th Fighter Bomber Group and was promoted to First Lieutenant in May 1955. 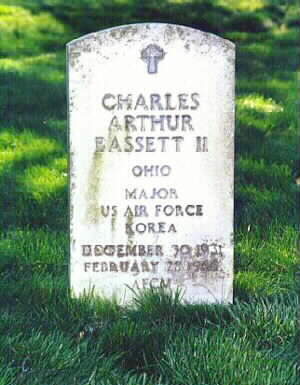 He returned for pilot duties at Suffolk County Air Force Base, New York, serving until April 1958 when he took the electrical engineering course at the U.S. Air Force Institute of Technology at Wright-Patterson Air Force Base, Ohio. He was promoted to Captain in January 1960 while on duty at Edwards Air Force Base, California, as an electrical engineer. In November 1960 he went to Maxwell Air Force Base, Alabama, to attend Squadron Officer School and returned to Edwards as an experimental test pilot in the Fighter Projects Office. He had about 2,800 hours flying time in jets. He reported to NASA's Manned Spaceflight Center in Houston, Texas, January 7, 1964 and subsequently became a Gemini 9 Astronaut. He died with fellow Astronaut, Elliott M. See, Jr., when their T-38 jet aircraft crashed on approach to St. Louis, Misouri, on February 28, 1966. One bright winter morning, the last day of February 1966, the Gemini IX foursome checked into Ellington Air Force Base, Texas, for flight clearance to St. Louis in two ual-seat T-38 jet aircraft. They planned to spend several days practicing on the rendezvous simulator at the McDonnell plant. got into the other plane. They took off from Ellington at 7:35 a.m. See and Bassett led, with Stafford and Cernan flying wing position. approach procedure and climbed straight ahead into the soup to 600 meters, intending to make another instrument approach. He landed safely on his next attempt. courtyard. Both pilots were killed. had been in good physical and mental condition, as attested by medical examinations and by reported pre- and in-flight conversations. Furthermore, See was reputed to be an excellent test pilot. Careful, judicious, and technically competent, he should never have crashed at all. Weather appeared to have been the major contributing cause, and pilot error prompted by a desire not to lose sight of the field had carried them too low. On Wednesday, 2 March 1966, Spacecraft No. 9, on its way to the flight dock for shipment to Cape Kennedy, passed an American flag flying at half-mast at the McDonnell plant. 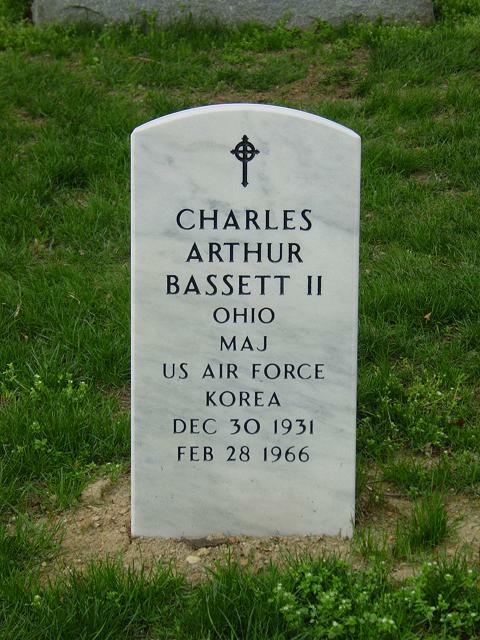 The next day, Elliot See and Charles Bassett, attended by their fellow astronauts, were buried in Arlington National Cemetery across the Potomac from the Nation's capital. NASA assigned the Gemini IX prime crew positions to Stafford and Cernan, marking the first time in the agency's manned space flight history that a backup crew had taken over a mission. 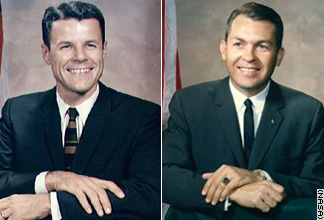 On 21 March James Lovell and Edwin Aldrin were given the backup duties. There would be no delay in the launch schedule.